Things To Do Near Openluchtzwembad Klarenbeek B.v.
Find hotel near Openluchtzwembad Klarenbe ..
Openluchtzwembad Klarenbeek B.v. is a public swimming pool in Arnhem. Nestled cozily in the hills, the club aims to give the most ultimate experience to its members and customers. With a total of three pools for different age groups, it is an ideal destination for a weekend with family. The adjustable temperature of the water makes it a popular destination all year round, but escaping from the scorching sun has its own enjoyment. The pool is clean and safe, and the club also has a sunbathing area decorated with lawns on all sides. Make your visit suitable to your interest, use Arnhem trip planner for personalization. Add accommodation and hotels in Arnhem that suit your budget including the most recommended ones like Fletcher Hotel Restaurant De Gelderse Poort, Het Wapen Van Elst, Hotel Arnhem Centraal and Hotel - Grand Cafe Atlanta. Explore the best Arnhem vacation packages that will take to you important landmarks of the city! For getting in, check out how to reach Arnhem. How to Reach Openluchtzwembad Klarenbeek B.v. 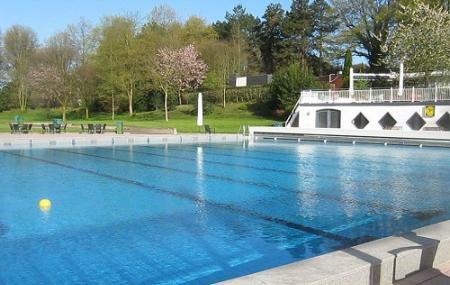 Things to Know Before Visiting Openluchtzwembad Klarenbeek B.v.
How popular is Openluchtzwembad Klarenbeek B.v.? Most popular time to visit Openluchtzwembad Klarenbeek B.v.
Average time spent at Openluchtzwembad Klarenbeek B.v.
People usually take around 30 Minutes to see Openluchtzwembad Klarenbeek B.v.
How to get to Openluchtzwembad Klarenbeek B.v.
93.9% of people prefer to travel by car while visiting Openluchtzwembad Klarenbeek B.v.
Attractions normally visited before or after visiting Openluchtzwembad Klarenbeek B.v.
People normally club together Park Sonsbeek and Netherlands Open-Air Museum And National Heritage Museum while planning their visit to Openluchtzwembad Klarenbeek B.v..
A nice swimmingpool, it's very spacious and there is enough room for kids to play. It can be very crowded when the weather is nice and on these days the personal is a bit aggregated. But it is a great places to cool down on a hot summer day. There are 3 pools; really young kids, medium pool about 50 to 70cm deep and a large pool for adults with also trampoline. Very controlled with 4 life guards. That also make sure people are not annoying or do so ethics g stupid. Around those pools a large green area where to chill. Also a small playground for kids. A bar is also there for simple food and drinks. I enjoyed my time there for half a day. Good swimming pool and good places to sit down and enjoy the sun and relax.